Rx is not a badge to be earned. Scaled is not a beginner version. Whether you see a workout and think Rx is either daunting or that it will be a cakewalk, remember this. Both matter only scientifically, neither are a reflection of you. Great training is found in giving your body the right stimulus to adapt and change in response to. Rx: The upper end of movement and loads that will allow for the stimulus to remain intact in the workout. Scaling: Expanding your threshold with movement and loads you can move well. It’s not a reflection of you in any way. – It makes you better. – It makes your character strong. You best your ego in scaling. Rx can always be made harder by getting a heavier kettlebell or doing Chest-to-bar pull-ups instead of regular, but you’ll miss the stimulus of the long-term program. How do you know when you should do either one? Am I capable of doing this version? Do I want to do that version? 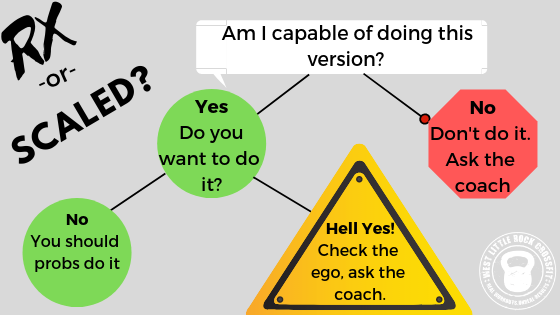 Yes> Check the ego, or ask the coach. You may end up doing it, you may not. The goal is not Rx movements. The goal is growth and expanding your threshold to become a more capable human. And don’t forget to have fun, and tell silly jokes.